Film is gone and anyone in Oppo Land who is serious about photography and video editing knows that it’s difficult to know what is real in a digital image. But there’s enough obviously real in this image, and accompanying images, to be problematic. The writer in this Atlantic piece makes a case that things may not be exactly as they appear, that folks’ interpretation is lacking or, my term, front loaded. I believe he is correct. If I look at this image, at the smirking youth on the left, a second time, I can imagine some doofus adolescent boy goofing around in a moment more complex and volatile than he has any idea. The expression on the youth in the center is a bit more troubling to me, more difficult to parse. 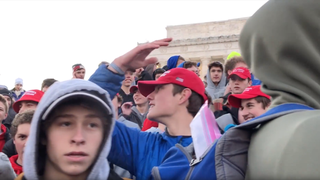 Prevalent though, is that the youth and his cohort chose to display their MAGA hats that day and their lives will never be the same for it. With those who steadfastly claim that rhetoric does not matter, I argue otherwise.